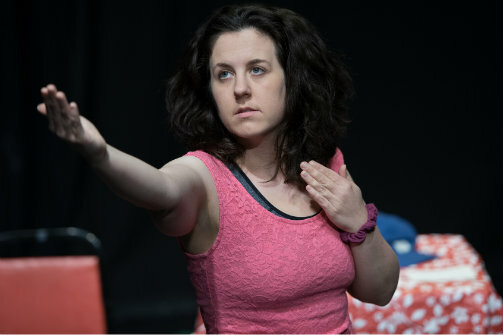 Clara Elser in The Love Song of Tonya Harding. Photo by Kevin McNair. BOTTOM LINE: Clara Elser performs an entertaining solo performance as Tonya Harding, telling her life story to redeem herself after the controversy of the 1994 Winter Olympics. The 1994 Olympics may seem like a lifetime ago, but for Tonya Harding, it feels like yesterday. Hosting a figure skating watching event, she wants us to know how it all went down for her, more than twenty years ago. It may help to know the basics of the Tonya vs. Nancy saga before seeing this show (Tonya’s ex husband Jeff, and her bodyguard Shawn, hit Tonya's competitor Nancy Kerrigan in the leg, injuring her before a competition), but either way, Tonya (Clara Elser) lays it out for you. She tells her life story about how she grew up in Oregon with all her mother’s multiple husbands, and how she got into skating. One of the more entertaining moments is when Elser reads the YouTube comments on the video of Tonya’s triple axel. It brings the show into our present day, which helps to contextualize the show we’re seeing. Although—maybe because the story is common knowledge—the storytelling isn't always compelling, and in fact the ending is rather anticlimactic. Elser’s portrayal of Tonya is extremely sympathetic as she tells her side of the events. It’s clear that she never meant to hurt anyone and had nothing to do with the attack, and she feels bad about everything that happened. The characterization doesn’t delve much deeper than anxiety and nerves, however. I was also interested to hear more about Tonya’s life post skating, after she was banned for life from the US Figure Skating Association. But this piece doesn’t really talk about that at all—The Love Song of Tonya Harding begins and ends with Harding's skating career. Elser does a great job holding the show on her shoulders, and the writing is believable and often very funny. Any fan of figure skating or famous feuds will enjoy this production at the Frigid Festival. The Love Song of Tonya Harding is written and performed by Clara Elser.